Palms – O Hei There! By now, most food enthusiasts in town have heard of Totoraku, an invite-only yakiniku restaurant in West LA that takes pride in its exclusivity. Some say that an invite to the restaurant is as hard to obtain as one to Noma; one has to be invited by a friend of the chef or a previous diner who had “earned” the right of a return visit, and said nominator has to personally vouch for you. 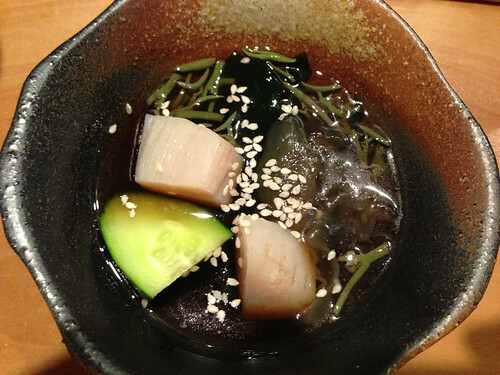 While an invite to Yamakase isn’t nearly as hard, the principles are similar. It’s technically an invite-only restaurant, but technically all you have to do is fill out a reservation request form on the restaurant’s website. They actually replied to my request within a hour, and I confirmed shortly after (although I’m not sure if my request for a month out made the process easier). Nice start to the meal, to familiarize us w/ what’s to come. 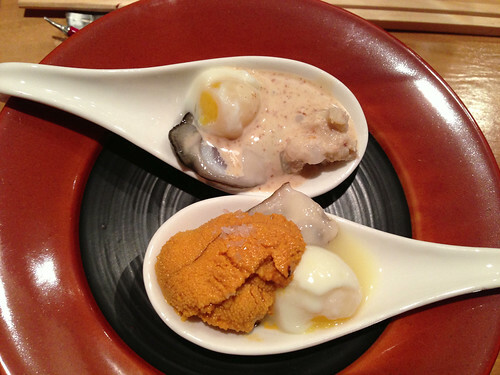 It’s nice seeing Hokkaido uni, since I’ve been having the Santa Barbara/San Diego varieties. Brings a different, delicious brininess to the table. A refreshing course w/ some ingredients unfamiliar to us. Kind of has a slime-on-slime effect here like a combination of yamaimo & okra, and a nice contrast in the firm, meaty texture of the pen shell. 2 wonderful one-biters here. The tofu from Kyoto is creamy and silky, like tofu “flower.” The subtle flavor of the tofu was enhanced by the creamy uni and sweet & tart tomato, respectively. This was an interesting dish. 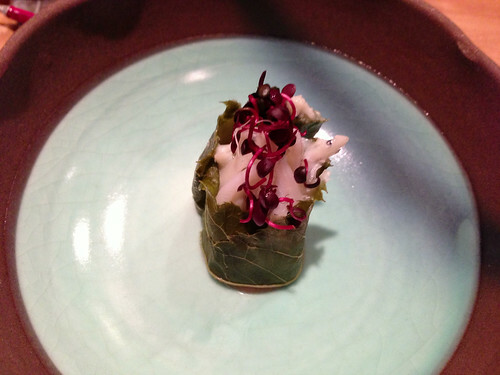 I’ve never had cherry blossom leaf before, and it had a grape leaf texture. Not much in terms of flavor, however, and the steamed ice fish itself was light too. In fact, the thing that stood out the most here is the “spicy” dried sprouts on top. Another duo of awesome one-biters, with Kusshi oysters being the central ingredient here. 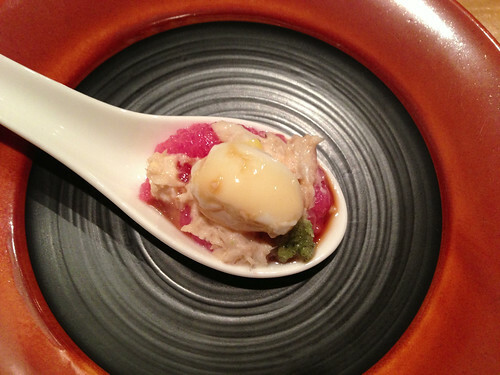 The sesame cream used in the top spoon is like a cross between the sesame paste familiar to us Chinese and a “dynamite” sauce – quite nice when contrasted with the yuzu/truffle salt flavors from the bottom spoon. Quail eggs were soft-boiled to almost a poached consistency. 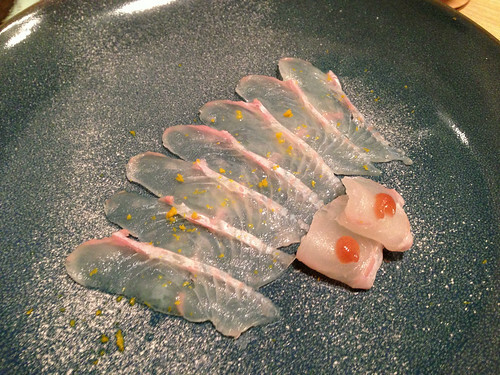 Beautiful knifework w/ the halibut slices here, which went well w/ the yuzu zest and Himalayan salt shaving that Yama-san applied right before serving. 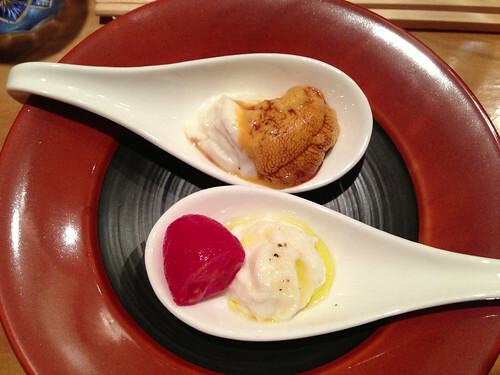 To the right are 2 meaty slices of engawa (halibut fin) from the same fish, served with a ume paste. 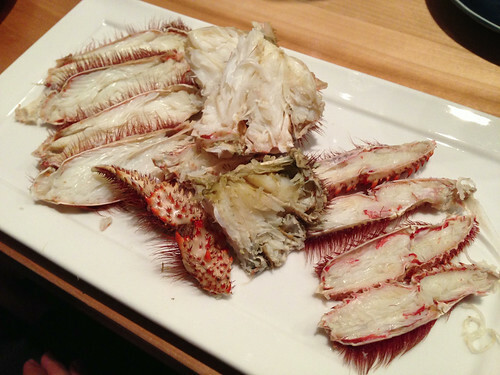 No assembly required – just hairy crab served as is (although de-assembly is certainly required to eat). These crabs are considered a delicacy (I’ve seen whole crabs served as is on the menu for $80-$100 at various restaurants), and the flavor is certainly worthy of reputation. Here, Lawrence and I split essentially half of one. We feasted like kings. 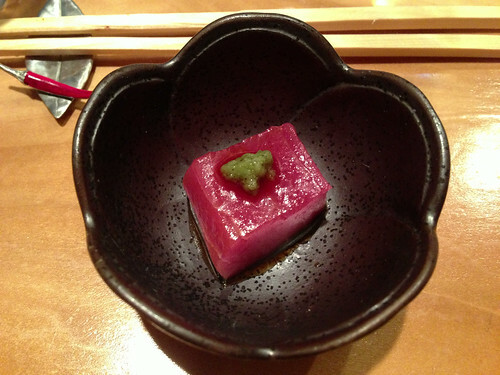 Just a “cube” of bluefin tuna (which was used in several dishes that night), served w/ housemade soy and fresh wasabi. Forbidden love in its simplest form. Besides the kegani and wagyu, these one-bite spoons were the highlight of the dinner, each one fully-loaded with various components and flavors. 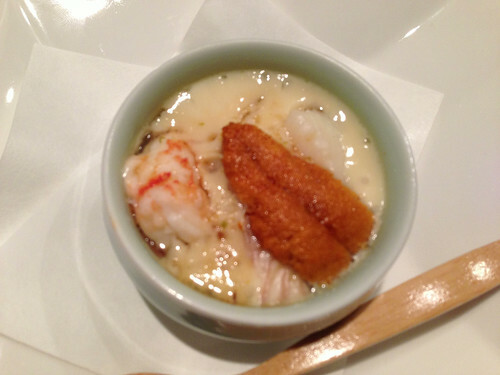 This was probably the most complex chawanmushi I’ve ever seen/tasted. It was quite mild upon first bite, but then the multitude of briny flavors came into play, which became apparent when we found out the number of ingredients involved. 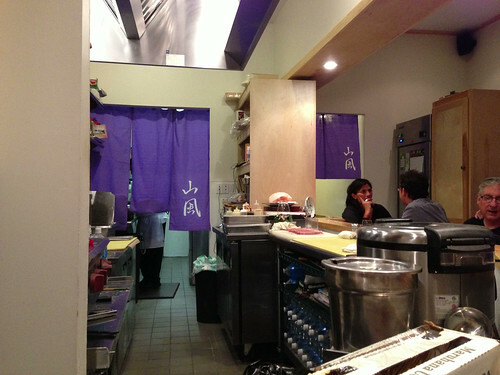 When asked, Yama-san began listing each ingredient…slowly (he might have even forgotten one or two here). A hot preparation of monkfish liver w/ the same sesame cream we had in an earlier course, but somewhat reduced by the accompanying ponzu. 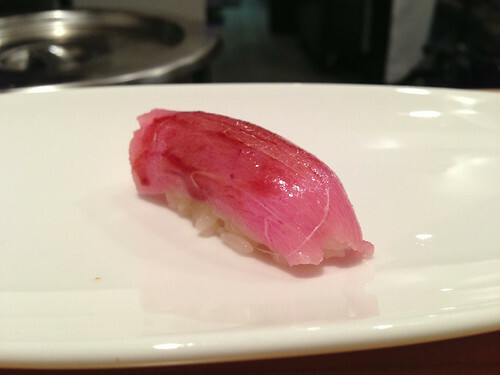 Wonderful ankimo, but I wanted it to be just a tad bit more “melty” (like I’ve had at Sushi Zo). 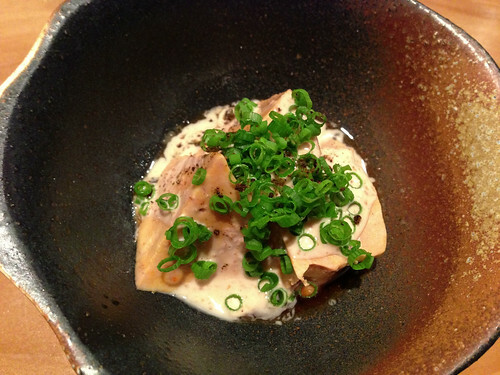 Yama-san got playful here (said he had been experimenting w/ this dish). 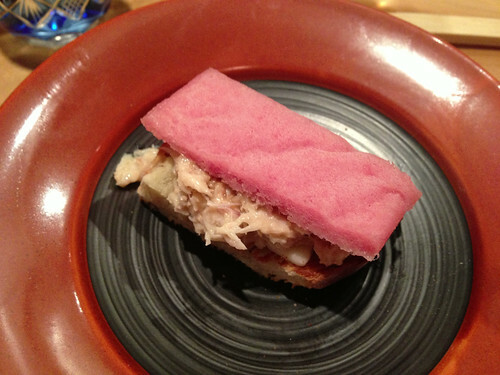 It was a piece of white toast, served with blue crab, truffle cheese, and a slice of frozen toro. The toro slowly began to melt w/ each bite of this creative play on a cross between grilled cheese and blue crab/toro hand roll. 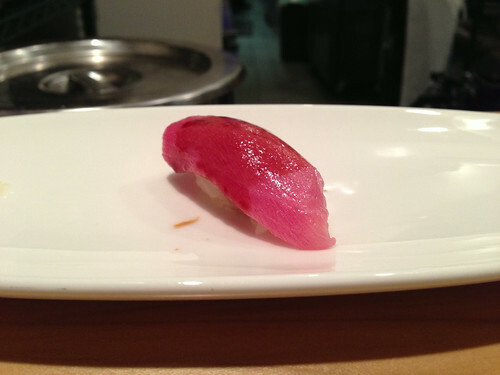 I still like my toro to be not frozen, but I certainly appreciated this dish. The ban has been lifted! Enough of the American/Australian imitators, what we have here is legit “Kobe” beef, with the requisite heavy marbling. 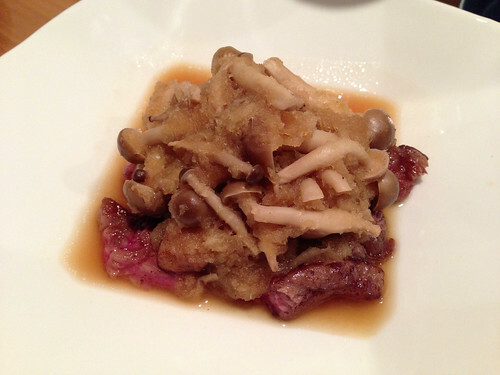 Yama-san grilled the beef, then sauteed it lightly with shimeji mushrooms and daikon. The yuzukosho helped cut down the fattiness (it actually didn’t taste very heavy, which was good when Lawrence and I basically split an entire steak), and the white pepper added a slight kick. 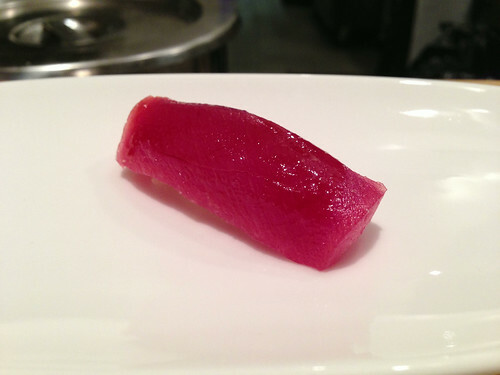 The bluefin tuna/toro nigiri were great, with some of the credit going to the wonderful tuna that Yama-san had been using throughout the night, and some going to the wonderful shari used. But if there’s one real “negative” to the meal, it’s that we didn’t see a wider variety of fishes used, especially w/ regards to nigiri. 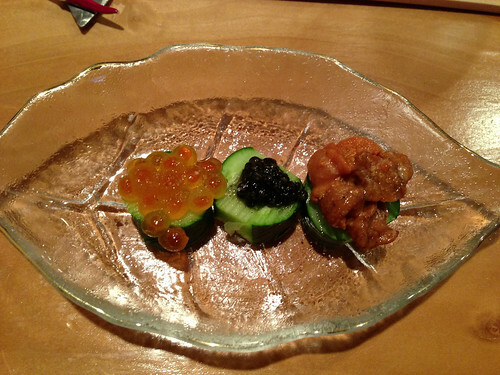 Next time, I hope to try a wider variety of sushi courses. 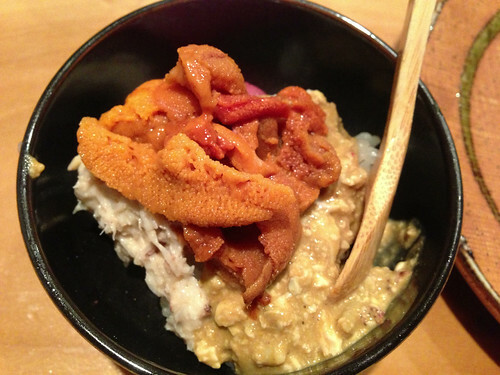 To finish us off, Yama-san threw together this amazing bowl of some drool-worthy ingredients. A truly creamy, savory, and briny overload here, and a nice-sized bowl at that. Lawrence wanted another one of these (in hand roll form). 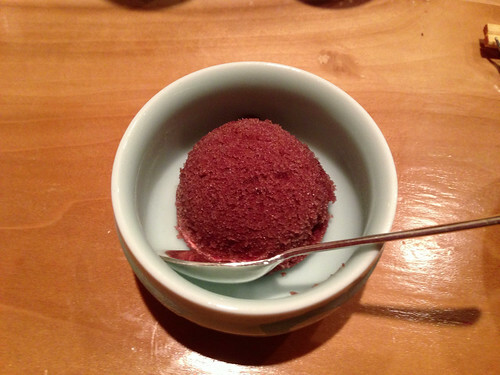 The sole dessert offered was a light sorbet, which I believed was mountain peach. It was refreshing, and a nice follow-up to the fairly heavy course beforehand. The dinner ended up being $208/person before tax & tip. 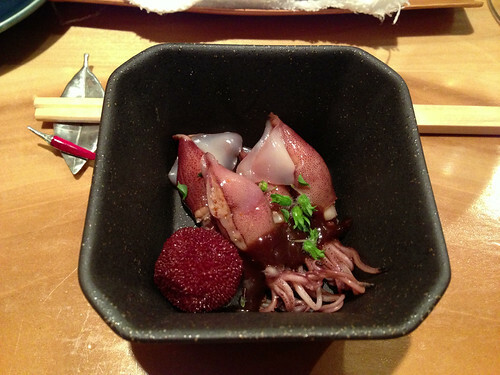 At first, we were thinking that it wasn’t cheap (and it obviously wasn’t), because it wasn’t as if we received an Urasawa-sized kaiseki of nearly 30 courses. However, the kegani and wagyu courses alone had to be $50+/person, so yeah, it was more than worth it based solely on ingredients. And that’s not even why you came to Yamakase. You came to see a master itamae at work, a one-man show doing it all before your eyes, while graciously describing everything and being an all-around wonderful host and storyteller. In fact, Lawrence and I loitered around for another hour after dinner, drinking some of Yama-san’s wonderful sake (which he provided on the house, and urged us to kill the bottle) with the man himself, chatting on and on without knowing that it had been four hours already. 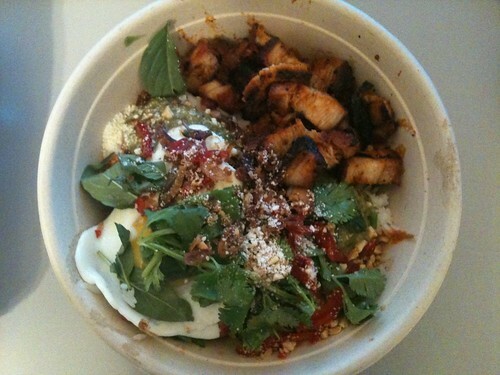 Chego is widely regarded as Roy Choi’s brick-and-mortar version of Kogi. The food that’s served at the restaurant, however, is probably somewhere in between Kogi and Chef Choi’s other restaurant, A-Frame. Back in the day, when I lived in the Palms area (less than a month ago), Chego was within walking distance from my apartment. Still, I wasn’t really amazed after a couple of attempts. Like I said in my A-Frame post, I considered Chego to be a decent place, but ultimately it was more hype than anything else. Everything there just seemed so…salty (and I like heavy seasonings). Well, why come back then (especially after moving out of the area)? I believe I ordered this on one of my former visits (probably did, since it has pork belly). It kind of reaffirmed my apathy for Chego’s food, but I have to say that this was better than how I remembered it. This time, I didn’t just taste salt and spice. Those flavors were very bold once again, but I thought there was a better balance this time around. However, it looks like there’s still too much going on in the bowl. Maybe it can be simplified a bit? Also, for pork “belly,” the meat wasn’t fatty at all. More of a pork chop cut. The fried egg and pickled radishes were a nice touch (but necessary? ), though I tasted no peanuts. Another item I wasn’t too crazy about in the past. Again, a better version than I had remembered. However, too much sambal oelek and sour cream in my opinion. But the flavors were very good. 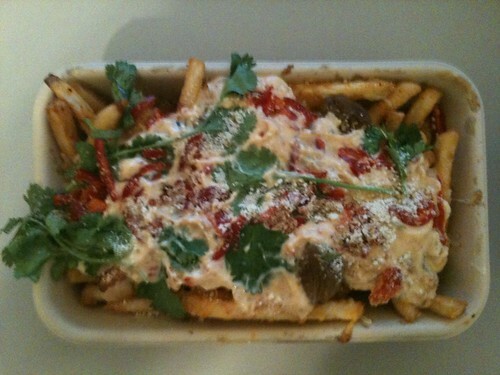 I particularly liked the pickled garlic, and the fries weren’t soggy at all. It’s still a common theme for the dishes at Chego to be in-your-face with salt and spice, and each dish still has a million bold ingredients. However, I found the food on this visit to be a little more focused and better balanced. I still feel like the food here is probably a hit-or-miss, but on this visit it was more of a hit. In the end, I consider Chego a flawed restaurant that has very interesting combinations of food (however of a mess those combinations are – consider it like a Pollock painting) that is quite enjoyable from time to time. Sushi Zo is located on National Blvd (slightly north of where it crosses Venice Blvd) in this really shady strip mall that contains Rite-Aid and Vons. You would never expect a $$$$ Michelin-rated sushi restaurant to be located in this plaza (and I live less than a mile away!). We had a reservation last night at 8pm for 5 people (I was the 5th wheel – not a joke). For these types of places, I prefer to sit at the sushi bar to get the full experience, but because of the size of our party we got a table. Not to worry though, because the whole restaurant is omakase-only (shouldn’t be any other way anyways at high-quality sushi restaurants)! First time I had omakase at the table. It’s a very small restaurant, probably less than 10 seats at the bar and a few tables for two, along with two bigger tables (one of which we occupied). The ambiance and decor was as expected, minimal. 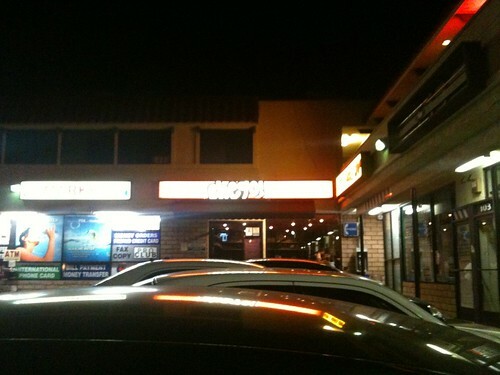 Definitely not a place you would bring a first date to. 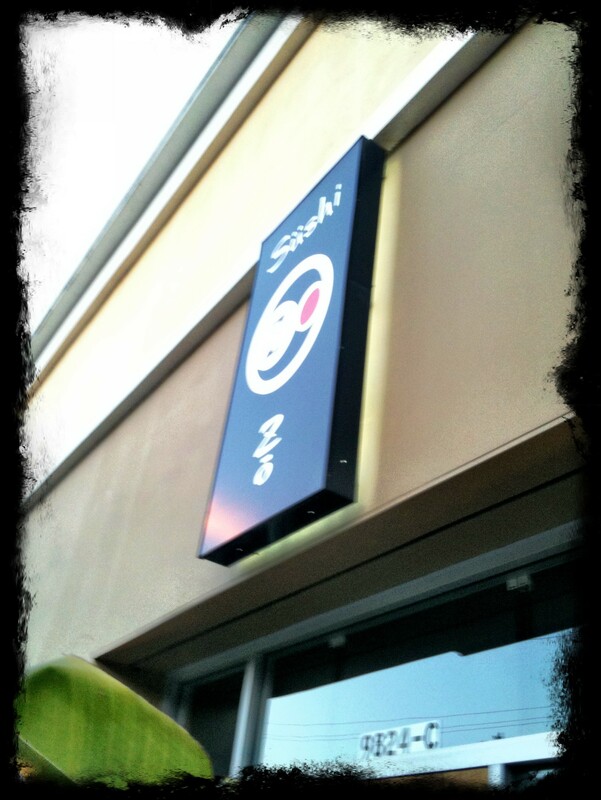 Because of the size of the place (and slight mix-up of reservations), we we seated at around 8:15. First of all, I would like to say that the service was excellent. I usually try to not have decor and service factor into my opinions of restaurants (unless something blew me away), but I was impressed by the attentiveness of the servers. From what I had been reading online, they sounded as if they would be pretentious and sneering. But what I personally experienced was warmth and care. There were three servers who worked the rounds in the whole restaurant – one was very talkative (she took my reservation days before and was basically chatting with me for minutes), one was very sweet (but unfortunately I couldn’t understand some of what she said), and one perky male who reminded me of Jo Kwon (of the Korean boy band 2AM, femininity-included). The pace of each item delivered was fairly quick (we spent a little more than two hours there, but we were among the last people in the restaurant who stayed after it was closed), and none of the empty plates sat for more than 10 seconds before it was cleared. Now to the part of the review where people will actually care/read about: the food itself. I had originally wanted to take pictures of each item (a la KevinEats), but I was so hungry I devoured the first few things I got in mere seconds, and didn’t realize that I had wanted to take pictures until a third of the meal was completed. And because of my ineptitude, I am unfortunately unable to remember every single thing I ate and had wanted to describe each one in detail. So here’s the general consensus on my meal: the omakase was around 20 items. I thought that all the dishes were excellent. The standouts to me were the Kumamoto oysters (with ponzu, momiji oroshi and scallions), the scallop (sweet and meaty), the monkfish liver (also with ponzu, momiji oroshi and scallions, and first time I had it with seaweed), the blue crab handroll (creamy deliciousness), and this other one I don’t remember (it made my friend squirm with joy). If there was any negatives to the food, I have to say that the sweet shrimp and salmon would be it. The amaebi tasted mushy and slimy. The texture was kind of like marinated shrimp that had been sitting around. I usually don’t order/receive amaebi at sushi restaurants, so I can’t say I’m the foremost expert on sweet shrimp (although KevinEats actually shares my sentiments). The salmon was good, but salmon at a high-quality place like this was… not befitting I suppose. Small notes about the food: the servers told you whether to use soy sauce or not for each item (since some were already dressed), and the sushi rice was probably the best I ever had. It was warm and moist, full of vinegar-y goodness. I know some people don’t like it that warm, but it’s the way to go. And I didn’t think of it at first, but the ginger must have been awesome for me to eat four containers of. After the omakase was complete, the servers asked if we wanted anything else. I asked them to give us something we didn’t have, which turned out to be sea eel. I also wanted another serving of uni, but by that time they ran out of everything. Jo Kwon kept apologizing and said that we should come early so we can get better/more stuff. In all, it was a great soft opening to my Elite Diners’ Club (not a club event technically, but enough members were there for me to call it such). The bill came out to be around $115/person without alcohol (and around $135 with). 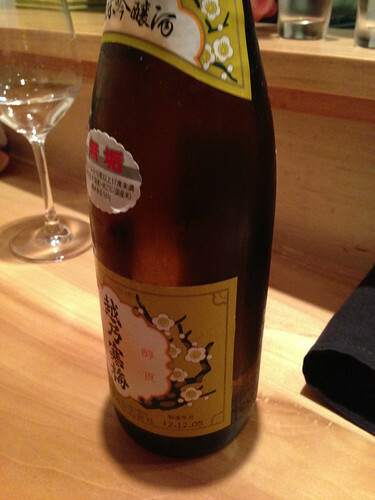 I had an Asahi (I believe it’s on tap – a plus) and we split a bottle of Senchu sake per recommendation (I like dry sake more, so our server said that this would be the one – good call). Despite the good vibrations, I felt like I didn’t get the full-on Sushi Zo experience (we didn’t get the yuzu juice I had been reading about!). I need to come back at an earlier time on my next visit, seated at the bar. But don’t let my snobby opinion deter people from giving this quality place at least one try. And congrats to my roommate Greg on leaving his job next week (and going back to law school)!